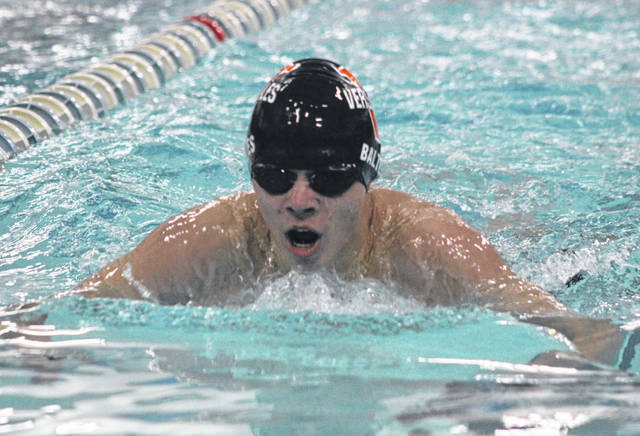 Versailles senior Cole Condon won the 500-yard freestyle race on Friday night at the Versailles Quad swim meet. Versailles freshman Madelyn Holzapfel competes in the 100-yard butterfly race on Friday night at the Versailles Quad swim meet. 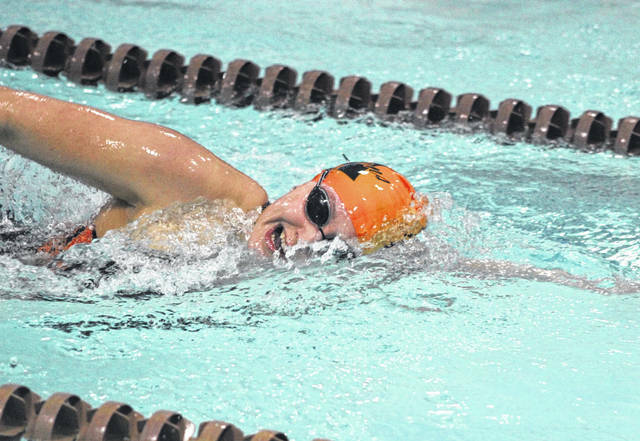 Greenville’s Maggie Bankson won the 100-yard backstroke race on Friday night at the Versailles Quad swim meet. 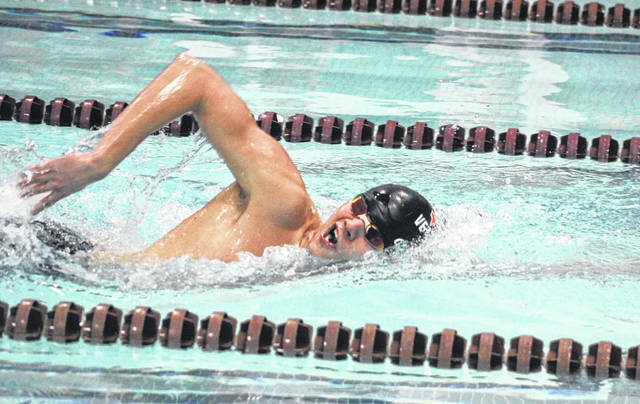 Versailles sophomore Ryan Subler competes in the 100-yard backstroke race on Friday night at the Versailles Quad swim meet. Versailles senior Stuart Baltes does the breaststroke portion of the 200 IM race on Friday night at the Versailles Quad swim meet. Versailles sophomore Alexis Jay does the butterfly portion of the 200-yard medley relay race on Friday night at the Versailles Quad swim meet. Greenville’s Carlos Badell does the butterfly portion of the 200-yard medley relay race on Friday night at the Versailles Quad swim meet. Ansonia’s Connor Stachler competes in the 100-yard butterfly race on Friday night at the Versailles Quad swim meet. 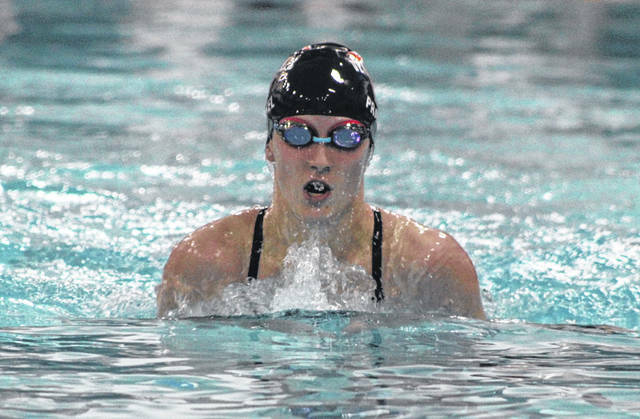 Arcanum senior Isabella Gable won the 500-yard freestyle race on Friday night at the Versailles Quad swim meet. Versailles junior Lucy Prakel does the breaststroke portion of the 200 IM race on Friday night at the Versailles Quad swim meet. 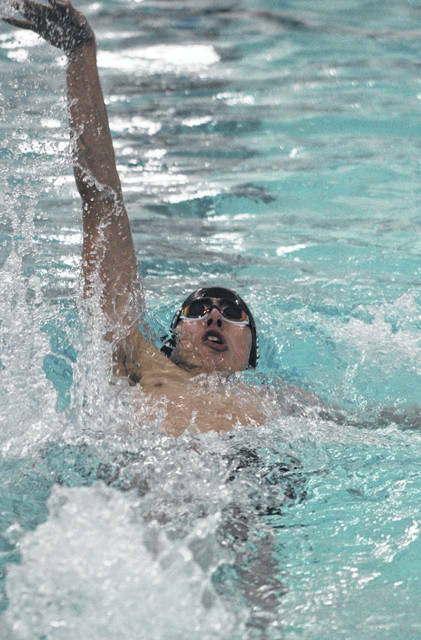 GREENVILLE – The Versailles boys and girls swim teams captured first place in seven events combined on Friday night on their way to winning their home quad meet at the Darke County YMCA in Greenville. The Tigers had a combined point total of 252, well ahead of runner-up Troy with 200. Greenville was third with 57 points followed by Arcanum with 48 and Ansonia with 9. The Tigers won the boys team title with 104 points followed by troy at 90, Greenville with 39, Arcanum with 22 and Ansonia with 9. For the girls, Versailles took first place with 148 points followed by Troy at 110, Arcanum with 26 and Greenville with 18. Senior Cole Condon had an outstanding meet for Versailles. He took first place in both the 50-yard and the 500-yard freestyle with times of 22.3 seconds and 5 minutes, 35.47 seconds respectively, and was on the winning 200 medley relay (1:46.65) and 200 free relay (1:36.57) teams. He was joined on both relays by Stuart Baltes and Ryan Subler with Owen Schultz competing in the medley relay and Jack Detrick in the free relay. Subler also had a standout meet taking second in the 100 backstroke (59.6) and third in the 200 free (2:09.78). The Versailles 400 free relay team of Ethan Davis, Alexander Grilliot, Isaac White and Evan VanSkyock also finished in second place with a time of 4:43.22, while Baltes took second in the 200 IM (2;26.78) and third in the 100 butterfly (1:05.5). The Lady Tigers had several standouts as well including the 200 medley and 200 free relay teams which captured first place in their events. The 200 medley relay team consisted of swimmers Madelyn Holzapfel, Lauren Menke, Alexis Jay and Tori Ahrens in a time of 2:08.3. The 200 free relay team won its race in 1:53.43 with team members being Sara Cavin, Jay, Holzapfel and Ahrens. Also in the relay events, Versailles took second place in the 200 medley (2:10.65) with the foursome of Grace Francis, Lucy Prakel, Sara Cavin and Bethany Jones, while the 400 free relay team of Chloe Francis, Olivia Waymire, Katelyn Rush and Morgan Frederick also placed as runner-up with a time of 5:07.44. Individually, Holzapfel finished as runner-up in both the 200 IM (2:36.69) and 100 butterfly (1:12.09), Cavin was second in the 100 free (1:02.75) and Prakel was third in the 200 IM (2:50.15) and the 100 Butterfly (1:14.85). Tori Ahrens also took third place in two events – the 50 free (28.25) and the 100 free (1:03.39), while Frederick finished third in the 200 free (2:31.07) and Courtney Batten was third in the 100 back (1:19.72). 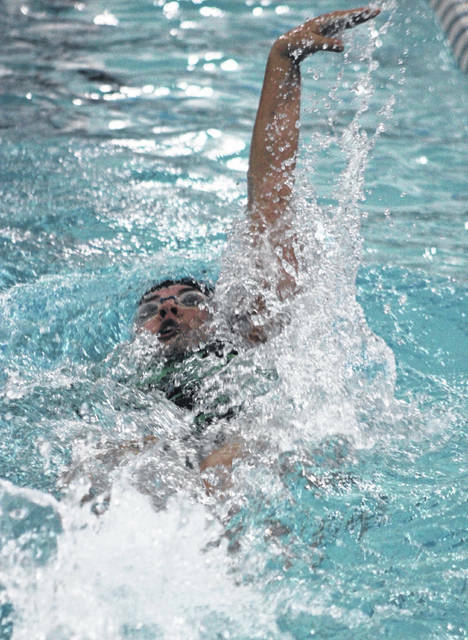 “This was a great meet for us tonight,” said VHS swim coach Mark Travis. “We had lots of good performances including 11 PR’s for the boys and 25 PR’s for the girls. Being able to compete against some of this local tough talent is always good for us in getting ready for the postseason. Travis praised the performances of several of his swimmers. 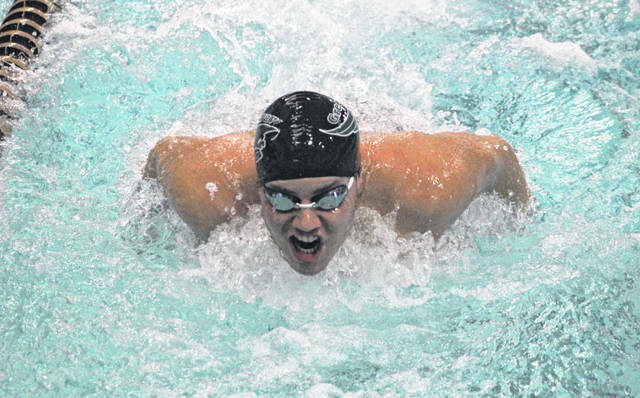 “Ryan Subler, a sophomore in 100 backstroke just continues to be a phenomenal swimmer for us this year,” Travis said. 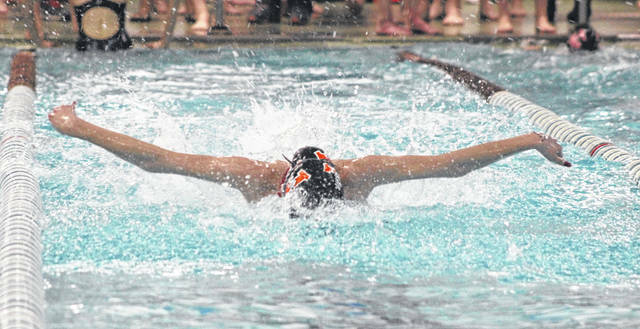 “Also sophomore Owens Schultz has had a really strong year for us in the 100 breaststroke. Our 200 free relay made up of Jack Detrick, who is a sophomore, Stuart Baltes, a senior, and Cole Condon, a senior who has been a standout for us as well, and then also Ryan Subler a sophomore. Both Greenville and Arcanum had several standout performances at the meet. For the Trojans, Isabella Gable won both the 200 free (2:04.78) and the 500 free (5:24.27), while Stephen Young also took first place in the 200 free (2:05.75). Second-place finishes for the Trojans included Young in the 100 free (54.88) and Jimmy Barry in both the 200 free (2:06.11) and the 100 breast (1:11.97). Brittany Stump earned a third-place finish in the 100 breast (1:30.88). For Greenville, Maggie Bankson was the only event champion. She took first place in the 100 back with a time of 1:10.62. Bankson also had a second-place finish in the 50 free (28.24) for the Lady Wave. Greenville had several third-place finishers including Carlos Badell in the 100 free (56.53), as well as the boys 200 medley relay (1:58.38) and the 200 free relay (1:47.59). The 200 medley team members were Josh Galloway, Pablo Badell, Carlos Badell and Landon Muhlenkamp, while the 200 free relay foursome included the Badell brothers, Muhlenkamp and Aaron Suter. Greenville coach Mollie Mendoza was pleased with some of the standout performances her team had. Next on the schedule for area swimmers is the Southwest Ohio Coaches Classic, which will be held this weekend at various locations on Saturday and Sunday. Finals will be held each night at St. Xavier High School’s Keating Natatorium.